Our experienced guides will meet with you at the Kotoka International airport Accra and transfer you to your hotel in Anomabo approx 2hours drive from the airport. After checking in you will spend the rest of the evening relaxing. Kakum National Park is one of West Africa’s surviving tropical rain forests. Here you will have a walk among the treetops on the Canopy walkway which is made up of seven bridges extending 330m, hanging 30m (100ft) above the forest floor. After the Canopy walk we go to our final destination for the day: Kumasi, the second largest city in Ghana and capital of the Ashanti region of Ghana. After breakfast we set off on the beginning of our Northern adventure, next stop is Techiman and the sacred monkeys of Boabeng-Fiema. We spend the afternoon and evening with the local community, enjoying traditional music around our bonfire under the beautiful African night’s sky. An early morning river safari in traditional dugout canoe viewing the endangered hippos being protected along the beautiful Black Volta River. We return to our lodge and spend the rest of the day exploring the surroundings. We end the evening with a barbecue prepared by our guide together with you! On day six we bid Wechiau farewell, and head off to Mole National Park Ghana’s largest, oldest and best game viewing park. Home to 90 mammals and at least 344 bird species. Here we embark on an afternoon foot safari, guided by an armed ranger, to view West Africa´s big game. The rest of the evening you can spend looking at the animals from the excellent viewing point overlooking one of the waterholes. Overnight at Mole Motel. 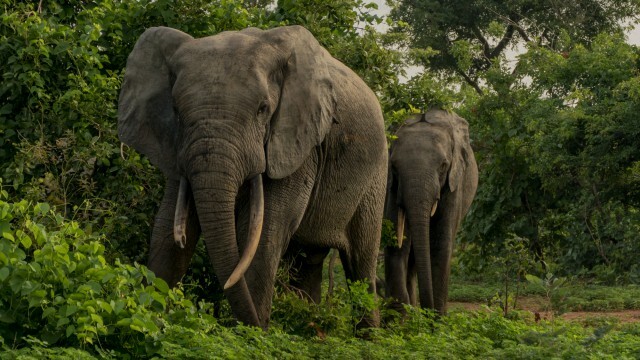 In the early morning we embark on the last trek at Mole to view the rest of West Africa’s big game that were not viewed the previous day, and then, after breakfast, we leave for the ancient village of Larabanga. Here you will witness the traditional way of life of the African rural communities, see the historic mosque and mystic stone situated in Larabanga, and then we head south to the beautiful Kintampo waterfalls. A morning visit to Kejetia market, the largest outdoor market in Western Africa, where we have the opportunity to pick up some bargain souvenirs and experience everyday life for the locals. We will also visit Manhyia Palace Museum, to obtain firsthand information on the legacies of the Ashanti kingdom. A regal history that dates back to 1700 is told with relics and artifacts. Enjoy a drive through the city with monuments dedicated to the memory of the great Ashanti people. After this we head back to Anomabo beach resort. Visit Cape coast castle, a UNESCO world heritage site for a thought provoking journey through Ghana's tragic Enslaved African trade era, and learn about the faith and last months of the men and women who where to be sent of as slaves to the Americas. This was their last outpost on the African continent. We will also make a stop at the Arts Centre where you will have an opportunity to use your bargaining skills to shop from an open-air market for artifacts from Ghana and West Africa. We will also stop for a visit to a coffin maker who specialized in different types of coffins (trucks, cows…). Transfer to airport for check-in and departure for home or the next adventure. This tour has been featured at TravelMag.com.